Autosorb 6iSA surface area and Pore Size Analyzer allows a researcher to get a 360 degree perspective of the complex material pore structure enabling a variety of analysis techniques including adsorption isotherms, desorption isotherms, single point BET, multi-point BET, Langmuir surface area, mesopore volume, micropore size distribution (using carbon dioxide), and micropore surface area. All classical data reduction models and the most comprehensive density function theory library available anywhere ensure that you get the most accurate results possible. 21 CFR Part 11 Compliant software (optional). Each analysis station served by a dedicated Po station, which increases the accuracy of pore size results. Bench Top or Cart Mounted Capability: Flexibility in space. Improved communications & data capabilities. Compatible with Windows® 7+ and Vista. Windows software with superior data reduction capabilities. Improved designs for operator safety. 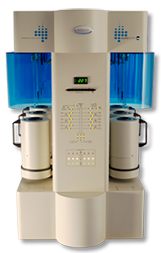 Built in filters at each station minimize the potential for elutriating powders into the analysis system. Unlike some other analyzers, a compressed air supply is not required - just mains electricity and analysis grade gases, plus coolant. Each sample port accepts three standard cell diameters and a variety of shapes to accommodate a wide range of sample types. The Dewars handles make them easily removable, yet they sit securely on the instrument because of their platforms’ raised edges and unique alignment feature. Expert users can program each requested datum point independently for equilibration. Automatically generated log files detail each analysis for easy troubleshooting by Quantachrome’s experienced service staff. A meaningful instrument status “dashboard” indicates analysis progress point-by-point for each station and latest updated Po value for each Dewar. Intuitive Windows-based software prompts the user for essential information that might be missing before an analysis can be started. The data reduction program can handle data files from other Quantachrome instruments for easy sharing of results. Tabular results can be saved as text files and exported as csv files for use in popular spreadsheet programs. Software allows single-point BET to be calculated (and plotted) at more than one P/Po value at one time. Allows for “what-if” approaches, i.e. what would the single point BET value be if it was calculated at another P/Po value. Report generation and printing can be fully automated, and customized page-by-page for content and order. A user has the flexibility to do BET before isotherm, or the other way round. Flexible High Throughput: Run up to six samples completely independently. Safety Shields: Attractive shields protect operator. Efficent Data Communications: Windows interface with USB port. Regulatory Compliant: 21 CFR Part 11 Compliant with full audit trails. Reliable: Trusted technology since 1988. Transducer Accuracy: 0.11% full scale. A/D Converter: 22-bit (1 part in 4,190,000). Ultimate Vacuum: 5x10-3 mbar achieved by dedicated 2 stage direct drive rotary pump (included). Surface Area Range: 0.01m2/g with N2 to no known upper limit. Coolant Level: Controlled to ± 0.5mm with RTD sensor. #32 Pratical Methods to Prevent Sample Elutriation in Vacuum Volumetric Gas Sorption Analyzers. #35 Micropore Size Analysis of Porous Carbons Using CO2 Adsorption at 273 K (0°C). #52 Adsorptives for Physisorption Experiments: Selection and Their Properties. #54 Automated Software Assistant for Proper Calculation of BET Area of Microporous Materials.